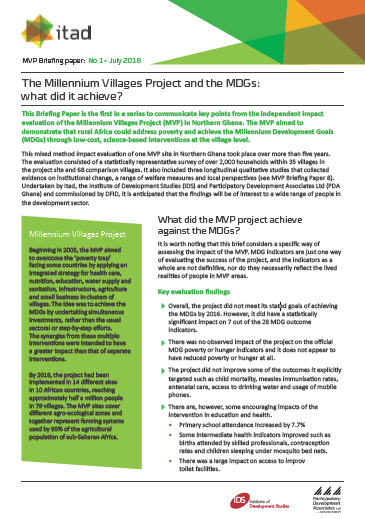 Millennium Villages Project Briefing Paper No.1: MVP and the MDGs: what did it achieve? This Briefing Paper is the first in a series to communicate key points from the independent impact evaluation of the Millennium Villages Project (MVP). The MVP aimed to demonstrate that rural Africa could address poverty and achieve the Millennium Development Goals (MDGs) through low-cost, science-based interventions at the village level. It is worth noting that this brief considers a specific way of assessing the impact of the MVP. MDG indicators are just one way of evaluating the success of the project, and the indicators as a whole are not definitive, nor do they necessarily reflect the lived realities of people in MVP areas.